After merging the three ASes (Lab 123/124), the administrators of AS 40 requested that AS 123 should not show in the path of the prefixes advertised by 123. They also requested that you configure R1 so that R4 can peer using either AS 123 or the previous AS 10. Pic. 2 - Current BGP Table on R4. Pic. 3 - R4 BGP Syslog. R4's BGP session has been torn down and re-established. R1 has established session with R4 using its local-as (AS 40). Pic. 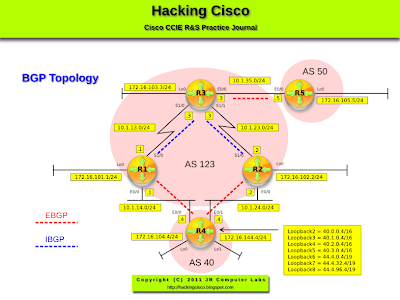 4 - R1's BGP Neighbors. R4 has established the session with AS 10 (local-as). Pic. 5 - R4's BGP Peering. Now, R4 can be reconfigured to establish session with R1 using its AS 123. Under a second the session with the new real AS number succeeds. Pic. 6 - R4 Reconfigured to peer with AS 123.